'I was determined not to follow existing fashions, but to create new ones'. This quotation from Arthur Liberty, founder of the London store that bears his name is as true today as it was when made more than a century ago. 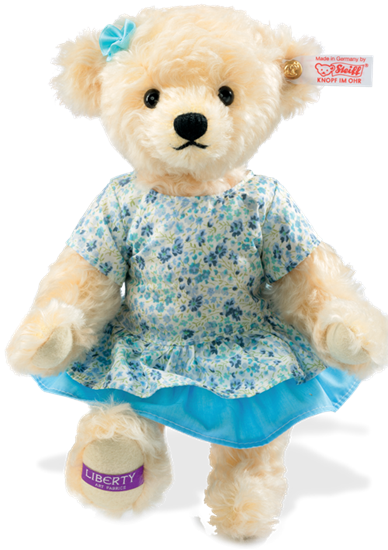 Here Liberty have created a special material exclusively for Steiff in a wonderful mixture of blues and white and Steiff then designed this lovely dress with a plain blue band around the bottom - just adding a little blue satin bow in her hair. Finally a Liberty label has been added to the bottom of one of Isabel's paw pads. Created exclusively for the U.K. and Asia, this beautiful teddy bear is made from the finest curly vanilla mohair. Meet "Isabela", a unique and beautiful teddy from the Liberty Collection by Steiff. She is 5 way jointed with small black eyes and a hand embroidered nose and mouth. Her gold-plated button in the ear is embossed with an elephant motif to celebrate the 110th anniversary of the button in the ear. She is surface washable.